Our annual conference took place on 19th and 20th June. It was split between the British Library (Monday 19th June) and UCL SSEES Library (Tuesday 20th June). 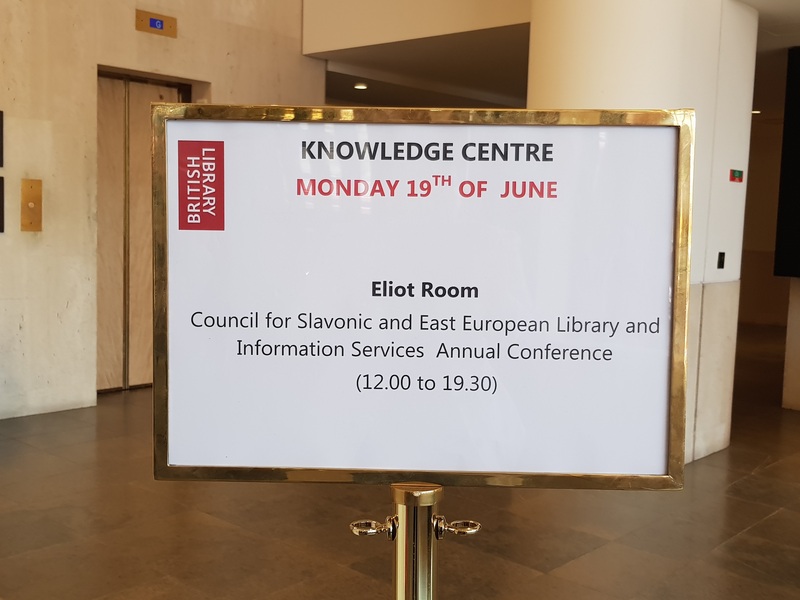 We spent the first day at the Eliot room of the Knowledge Centre at the British Library, where several presentations took place. Our opening presentation was delivered by Adina Bradeanu from the Taylor Institution Library. Adina spoke about the Romanian “Sahia Film” studio and its history. Her presentation was entitled: Re-discovering a ‘propaganda’ film studio in post-communist Romania: notes from the frontline (talk and screening). The talk was accompanied by the screening of three short documentaries from “Sahia Film” studio. Adina’s talk was followed by a panel dedicated to exhibitions in the UK focusing on the Russian Revolution. The panel was chaired by Janet Zmroczek from the British Library and the panellists were the curators of the exhibitions. As this year witnesses the centenary of the Revolution, there is great interest in various aspects of the Revolution, which is mirrored by the exhibitions. The first talk was delivered by curator Natalia Murray from the Royal Academy of Art. Natalia talked about her exhibition: Revolution: Russian Art 1917–1932 , which explored the Revolution through the lens of its pioneering art. Our next speaker was curator Richard Davies from the Leeds Russian Archive. Richard’s exhibition is entitled: Caught in the Russian Revolution: The British Community in Petrograd, 1917-1918 and focuses on the British community in St Petersburg during the Russian Revolution. Katya Rogatchevskaia from the British Library and the curator of the exhibition Russian Revolution: Hope Tragedy, Myths talked about how the exhibition was envisaged and put together. The idea was to take a fresh look at the Russian Revolution. The exhibition features many rarely-seen items such as a first edition of the Communist Manifesto and Lenin’s handwritten application for a Reader’s Pass at the British Library from 1902. The panel was followed by a presentation from vendors. This year presentations were delivered by Bea Klotz from the Central and Eastern European Online Library, Marta Berdychowska from Lexicon, Aleksander Smoljanski from Integrum and Zina Somova from Eastview. All the presentations finished around 7pm and were followed up by a wine reception and conference dinner at The Parcel Yard. The next day we met at UCL SSEES in the Senior Common Room (Masaryk Room). The day started with the annual general meeting of COSEELIS, chaired by Katya Rogatchevskaia (the British Library) and Mel Bach (Cambridge University Library), where various aspects of our activities were summarised and discussed. The annual meeting was followed by two panels. The first one, entitled PhD research in the Slavonic collections, was chaired by Wojciech Janik (UCL SSEES Library). The first presentation was delivered by Zina Kostadinova: Personhood, subjectivities and everyday ethics and practice amongst Sufis in Sarajevo: researching the UCL SSEES collections. It was followed up by Peter Braga’s talk on Authoritarian Persistence and Omni-alignment: Russian, Ukrainian and Belarusian relations with China, 2006–2016. Our speakers talked about their research and the way their research is conducted. It was a very interesting panel which many librarians found as a very useful insight into how we can offer better support to the research needs of our students. Our last panel was entitled Slavonic collections and specialist projects and was chaired by Katya Rogatchevskaia. The first speaker was Graham Camfield (former Collection Development Manager, LSE Library), who delivered an interesting presentation on the history of the LSE Library: Making space for books and readers: a history of LSE’s Library. Our closing presentation was delivered by Gregory P.M. Walker: Research in Russian and East European studies: trends and realities from the UTREES, who covered the origins and development of the University Theses in Russian, Soviet and East European Studies (UTREES) database, as well as recent trends in Russian and East European Studies. We are hoping to publish a post on our website in the near future based on Gregory’s presentation. After the conference the colleagues were offered a visit to UCL SSEES Library, to attend the British Library exhibition (Russian Revolution: Hope, Tragedy, Myths) or to see an interactive installation: Homeland(s) – Real and Imagined, part of UCL Festival of Culture and curated by Zuzana Pincikova from UCL SSEES Library. We would like to say thank you very much to our friends and colleagues who attended the conference! Next year the conference will take place in Cambridge. This entry was posted in Collections, Conferences, exhibition, news and tagged 1917, conference, COSEELIS, Eastern Europe, exhibitions, libraries, Russia, Slavonic. Bookmark the permalink.